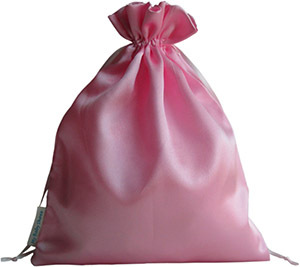 This satin bag is made w/ custom printed tag sewed into the side. Your logo can also be printed and sewed into the bag side. With the smooth and shiny surface, it looks very elegant. There is a satin ribbon drawstring at top. Sizes and colors can all be customized. It's great for parties, gifts, favors, jewelry, and more.